We are delighted to premiere the new single ‘Someone told me I was Paradise for you’ from the gifted Copenhagen-based quartet We Like We. The gorgeous new sonic creation is the first material since the band’s critically acclaimed debut album ‘A New Age of Sensibility’ (released in late 2014). The highly anticipated single is released tomorrow, 1st September 2016. “This single is one of the results of our work over the past six months. We have had a close collaboration with sound engineer Marc Casanovas (NorCat Lyd) with whom we have explored sound, space and different ways of recording”. Someone told me I was paradise for you is the endless mantra that is whispered in to your ear during the late hours of a dark blue summer night. It is four individual voices and reflections braided together as a unit in the depths of the collective unconsciousness. At the half-way point, the mesmerising voice of Katinka Fogh Vindelev whispers directly to one’s mind’s eye. Like a bird in full-flight, these four combined elements of strings, voice and percussion soars majestically with unlimited possibilities of discovery, exploration and chance. The mantra-like phrases sung by Vindelev transports the listener to the poignant, dream-like fantasies of Kazuo Ishiguro’s master novels or the otherworldly realm crafted by Kafka. This sublime tapestry of gradual blissed-out tones reveals inner-most truths and awakens a myriad of feelings and emotion. The compelling, ambitious and sublime new single is nestled nicely amidst the avant-garde, modern-classical and luminaries such as Scott Walker (‘Tilt’ era) and L.A’s Julia Holter and ‘Parallelograms’-era Linda Perhacs. Interview with We Like We. 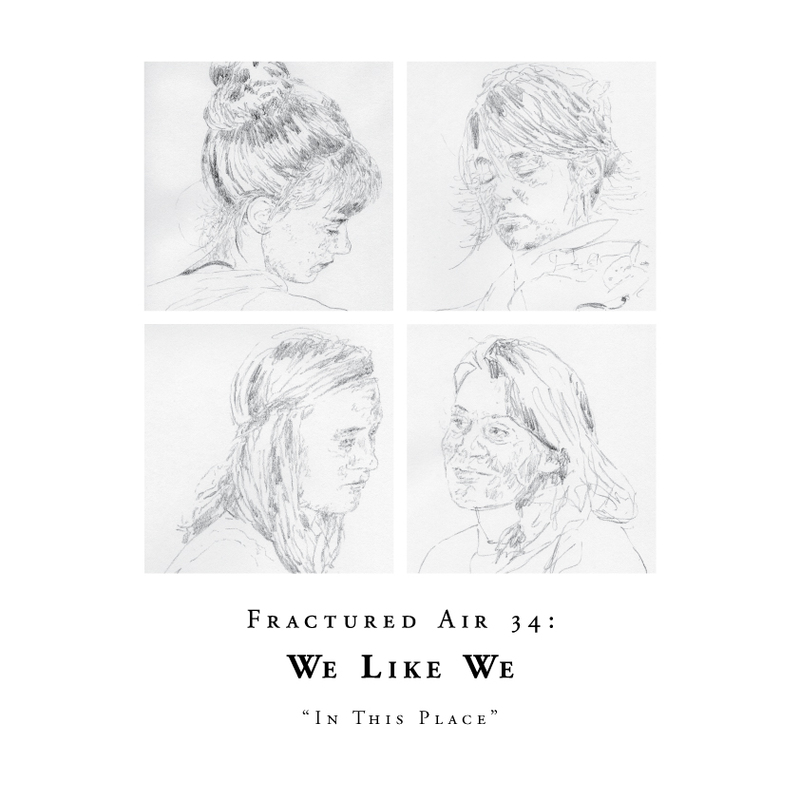 We like We is an experimental performance and sound quartet based in Copenhagen, Denmark. Encompassing worlds of neo-classical, experimental pop and avant-garde soundscapes, the highly promising and gifted quartet comprises of Katrine Grarup Elbo (violin) Josefine Opsahl (cello) Sara Nigard Rosendal (percussion) and Katinka Fogh Vindelev (voice). All four members are classically trained, but each share a desire for exploring, experimenting, jamming and shaping a sound of their own. Expanding their inspiration and influence from the classical roots We like We makes music driven by intuition and playfulness. I feel a lovely parallel exists between the Danish quartet’s highly-evocative and intuitive compositions and Iceland’s Amiina such is the unwavering beauty and utter magic the masterful musicians create with each sacred note. Through their collaborative compositions, We like We creates music that travels beyond the grid of genres. The band’s debut album ‘A New Age of Sensibility’ contains a kaleidoscope of enchanting sounds from the rhythmic pulses of ‘Anticipation’; spellbinding intermezzi capturing moments of divine transcendence (‘Tango’ and ‘I Began To Fall Apart’) and multi-layered choral patterns interwoven with immaculate instrumentation of strings and percussion (‘The Sound Of My Own Voice’). The group’s first live performance took place at FROST festival in Copenhagen in February 2013: a unique double-bill concert with Efterklang, playing on top of a 1400-ton heavy diesel engine. Lead singer Katinka Vindelev has toured the world with Copenhagen’s Efterklang in addition to being in the choir for U.S. luminary singer-songwriter Julia Holter. Furthermore, Vindelev’s solo project of I am now offers an invaluable insight into an incredible talent. Violinist Katrine Elbo has performed with Danish artists Rasmus Seebach, Mew and Sanne Salomonson as well as a host of others (including The Danish National Symphony Orchestra). Percussionist Sara Rosendal has been an integral part to various Danish orchestras like DRUO, DRSO and The Royal Danish Orchestra. Josefine Opsahl (cello) has worked with a wide array of composers, most lately with Russian composer Sofia Gubaidulina. Congratulations on the stunning debut album, ‘A New Age of Sensibility’. One of the striking aspects of the debut record is the sheer range of styles and musical traditions; at once it feels a beautifully realized fusion of modern-classical and pop music. Firstly, please discuss the writing process for these musical compositions? I can imagine certain pieces such as ‘The Sound of My Own Voice’ and ‘Tisina’ took quite some time to come to completion? Sara Nigard Rosendal: Thank you for the kind words. All of our music emerges from a place of curiosity and playfulness. In the making of this album we had long jam-sessions that we recorded. We then listened to these and found some interesting themes or sounds that we tried to develop. We have worked with different dogmas in order to always expand the scale of what each of our instruments can do. None of the music is written down and there is always a touch of improvisation when we play. We like it that way, because it keeps the tracks alive. Katinka Fogh Vindelev: This album has evolved slowly within a period of 2 years. Creating the music after getting invitations from two different progressive festivals in Copenhagen. Firstly FROST in February 2013 and later same year the experimental Wundergrund Festival. So instead of rushing into a studio, we’ve shaped and composed the music with a live concert mindset so to speak, cutting into the core of what we as a group are capable of playing and wanting to express together. SNR: ‘Tisina’ means Silence and was an attempt to make a track that dwells on simple phrases and sounds and then create a state of meditation. It became very clear, however, that in the deep of silence there are a few demons as well. This was not something we planned – it just happened. It was not really a hard piece to make, it just requires the right state of mind and a good sense of reacting and communication. KFV: ‘The Sound Of My Own Voice’ was a more complex composition yes, but as we’re always on the lookout for the essence of our ideas, it slowly revealed itself as repeating patterns slightly out of sync, each instrument representing an individual voice, explaining the title as well ‘The Sound Of My Own Voice’. In terms of the instrumentation, there are gorgeously crafted arrangements throughout the record, for voice, strings and percussion also. I would love to gain an insight into your classically rooted backgrounds? Each member clearly brings their own unique vision to this special record and clearly, a deep connection is formed between the members. SNR: We are all studying at the conservatory. 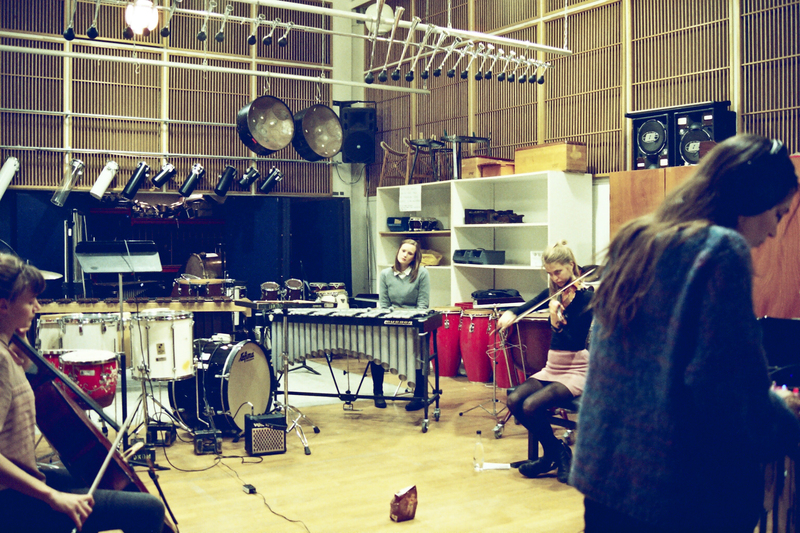 Josefine and Katrine (cello,violin) are currently doing their masters at the Royal Danish Academy of Music. Katinka (voice) has a BA degree in classical voice and is currently doing her Masters in Electronic Music and Sound Art alongside private singing lessons in Copenhagen and Berlin. I have a BA from the Royal Danish Academy of Music and I am currently studying my masters in the music academy in Malmö, Sweden. We are all very happy to undergo this education. It gives us a high technical level on our instruments that then provides freedom to express ourselves. Having the entire music history as a background when creating music, is extremely helpful. I would also love for you to recount your memories of forming We Like We? It’s fascinating (and very fitting) that your first live performance took place at a festival in Copenhagen alongside Efterklang in 2013. You all must have fond memories of this particular concert. 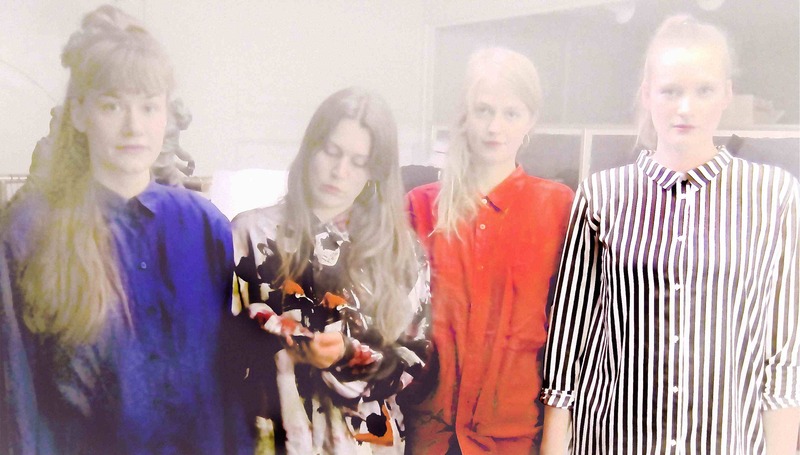 KFV: It took us about a year before we met Sara, so We like We was founded by Katrine [Grarup Elbo], Josefine [Opsahl] and I in August 2012 collaborating with an electronic musician, who happened to be my sister. Due to a life changing event, including the birth of my wonderful niece she pulled out shortly after our first concert and We like We continued for a while being a trio. This was an important transition, realizing that we wanted to create all the electronic layers ourselves as a natural expansion of our acoustic instruments instead of having a fourth member with a non classical background effectuating us. One day in the middle of an improvisation session I desperately grabbed a pair of claves and it became crystal clear to everyone in the room, we needed a percussionist. (Haha) Luckily Sara, who was already a friend of Katrine and Josefine’s, had common ideas and courage and joined We like We in the late Summer 2013, completing the band. SNR: There is definitely a unique chemistry between the four of us. Each of us really needed the platform that We like We is. We all needed to do something more than what we would get from our schools. We wanted to be a part of the initial phase of the creative process – to be more than interpreters. KFV: Regarding our first concert alongside Efterklang in February 2013, it was of course an extraordinary event for us. It felt like the beginning of something very unique, That night we performed on top of a 1400 ton heavy Diesel engine, wearing handmade costumes, that we designed ourselves and we had even hired a light designer. Liberating, personal and inspiring at the same time. 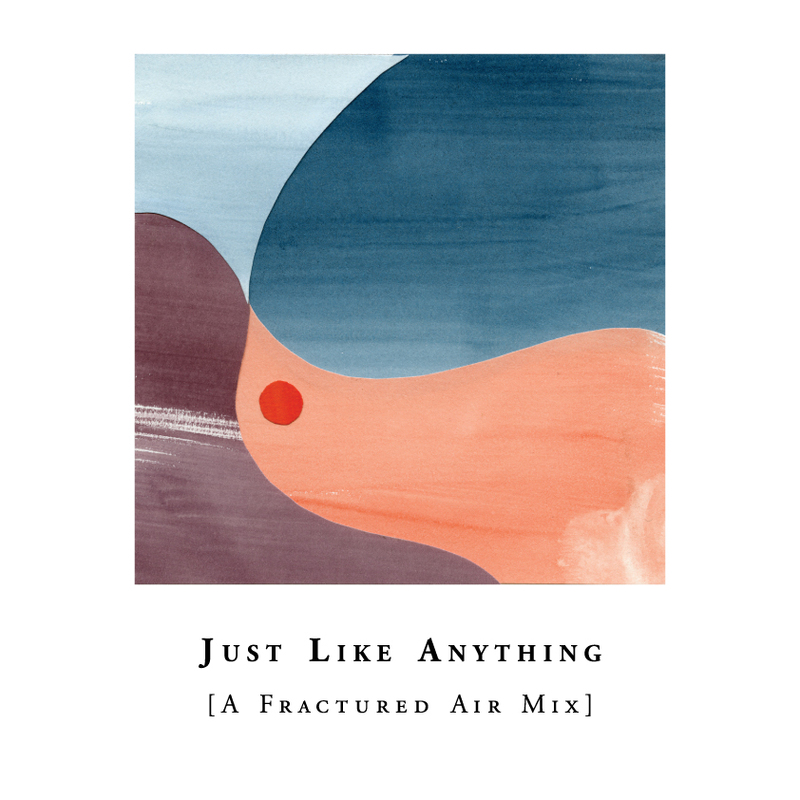 I’ve been touring with Efterklang for a couple of years (singing and playing keys) alongside starting up with We like We back in Copenhagen, so we were already closely connected personally and professionally. Efterklang have curiously followed us from the very beginning, supported us, showing up at our concerts etc. Such an acknowledgement from a band, that is known for taking quite some musically risks themselves, does of course mean a lot to us. My current favourite must be ‘The Sound Of My Own Voice’. It’s such an utterly captivating composition with intricate string arrangements and stunningly beautiful choral patterns. Please discuss the construction of this particular composition? I wonder did the words and voice parts come first or was it the cello and violin parts? I just love the dynamic, and how the piece gradually unfolds (and blossoms) before your very eyes. SNR: ‘The Sound of my own Voice’ was supposed to be a strong proclamation of the right to be an individual. In the case of this particular track, the message came before the lyrics and the music. However, we discovered that there is a lot of pain and vulnerability in saying that you only need yourself. It is a battle between individualism and communion… ‘The Sound of my own Voice’ is a track that has had different shapes before the album-version, where we have worked with different melodic patterns played displaced. It becomes a kind of ‘free polyphony’. I love the sequencing of ‘A New Age of Sensibility’ where several short passages are inter-woven with the more lengthy pieces. For example, ‘I Began To Fall Apart’, despite it being just over one minute in duration, a spectrum of emotion ascends into the forefront of your heart and mind. Was it a conscious decision to include shorter pieces (which also serve wonderfully as interludes) on the album? SNR: We have thought of the shorter pieces as intermezzi (we mostly use classical terms when talking about music, because that is the language we know). When in the practice room, we would say ‘we need some ginger’ – something to ‘rinse the mouth for new flavours’. It was conscious that some pieces would be short and some long and that some pieces would only involve one or a few of us (‘I’, ‘Wakey Wakey Beast’, ‘Tango’…). We wanted the entire album to be one long narrative but for each track to still tell a story in itself. The album was mixed in collaboration with sound artist Jacob Kirkegaard. Was there a stage in the music-making process that proved most challenging for you? Also, during the recording sessions themselves, was it a case that happy accidents would occur naturally that would lead to sketches or ideas of a song? KFV: It was quite an intense but super smooth recording session. 11 tracks in 3 days back in February 2014 at the former National Danish Radio’s epic studios in Copenhagen. Magical almost, suddenly being in a studio, experiencing how we nailed a lot of the tracks in first take. We obviously had common visions. Recording all at once, giving the album this unpolished live touch that I find very compelling. Having Jacob Kirkegaard on board, was a fine addition to the post-production, as he has such good ears, specialized in mainly unheard sounds. As he is also my partner he and I spent all summer in NYC on an artist in residency programme, working sporadically on the mix from April sending it back and forth across the Atlantic, for the other’s to give feedback. It turned out to be quite a time-consuming and challenging process while our music demands a lot of shaping and balancing, the instruments in between, being super dynamic, consisting of a group of four equally important voices. But it was worth the effort, of course and we wrapped up the final mix by the end of August. SNR: Working with acoustic instruments alongside a sometimes heavy effectuation can be challenging, or at least it can be time-consuming to get the balance right. There were many magical moments. I remember that the track ‘Unite Me’, we really nailed first take. When we listened to it, right after recording, it was a complete feeling if unified transcendence. We all cried. ‘Anticipation’ conjures up the timeless sound of Steve Reich’s ‘Music For 18 Musicians’ with its sublime rhythmic pulse and compelling arrangements. I would love for you to discuss the various parts to this particular composition. SNR: We are big fans of Reich so it is nice to be associated with him. ‘Anticipation’ is one of the more energetic pieces on the album and definitely is inspired by minimalistic pulsating rhythm. This helps underline the title as well. KFV: We wanted to work with an often experienced consequence of anticipation – at least according to us. You are expecting something. You are eager. You are pulsating from excitement. You are narrowing down your experience of what is actually happening, overshadowed by your wishes, your anticipation, instead of staying connected and true to the moment. And suddenly, bang, reality hits you. You are out of breath. We found it interesting to work with this sort of unexpected collapse. Illustrated by a hectic rhythm suddenly dissolving, breaking down, and turning into a slow tango – out of nowhere. How many times does life actually evolve as anticipated? There is something extremely beautiful about these processes and transformations. In terms of inspiration and musical influences, please discuss your most cherished composers and artists? Also, what are your earliest musical memories? SNR: One of the biggest and also early musical memories is listening to Per Nørgårds I Ching (solo percussion) when I was about eleven. That was when I realized what music could really do. Especially the third movement including a kalimba was mesmerizing to me. My earliest memories is of my father playing the guitar, I think. KFV: I was very much into Chopin as a kid, but who wasn’t? It’s so catchy and soulful at the same time! Now I listen to all sorts of music and sound. I easily get bored when it comes to mainstream music, classical as well as pop/rock, it’s just too predictable. Silence is great though. I just worked with Julia Holter, and I think she is such an interesting composer. I love when artists manage to create catchy music with a twist. That’s a true skill. Who else… Terry Riley, John Cage, Schumann and Kuku Sebsebe.